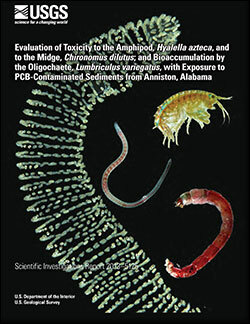 The U.S. Environmental Protection Agency (USEPA) requested that as part of the remedial investigation for the Anniston, Alabama Polychlorinated Biphenyl (PCB) Site (Anniston PCB Site), that Pharmacia Corporation and Solutia Inc. (P/S) perform long-term reproduction toxicity tests with the amphipod, Hyalella azteca, and the midge, Chironomus dilutus, and bioaccumulation tests with the oligochaete, Lumbriculus variegatus, using sediment samples collected from reference locations and from Operable Unit 4 of the Anniston PCB Site. The sediment toxicity testing and sediment bioaccumulation results will be used by ARCADIS U.S., Inc. (ARCADIS) as part of a weight-of-evidence assessment to evaluate risks and establish sediment remediation goals for contaminants to sediment-dwelling organisms inhabiting the Anniston PCB Site. The goal of this study was to characterize relations between sediment chemistry and sediment toxicity and relations between sediment chemistry and sediment bioaccumulation in samples of sediments collected from the Anniston PCB Site. A total of 32 samples were evaluated from six test sites and one reference site to provide a wide range in concentrations of chemicals of potential concern (COPCs) including PCBs in samples of whole sediment. The goal of this study was not to determine the extent of sediment contamination across the Anniston PCB Site. Hence, the test sites or samples collected from within a test site were not selected to represent the spatial extent of sediment contamination across the Anniston PCB Site. Sediment chemistry, pore-water chemistry, and sediment toxicity data were generated for 26 sediment samples from the Anniston PCB Site. All of the samples were evaluated to determine if they qualified as reference sediment samples. Those samples that met the chemical selection criteria and biological selection criteria were identified as reference samples and used to develop the reference envelope for each toxicity test endpoint. Physical characterization of samples of whole sediment included analyses of grain size, TOC, and nutrients. Organic chemical characterization of samples of whole sediment included PCB homologs and select (13) PCB congeners, parent and alkylated polycyclic aromatic hydrocarbons (PAHs), organochlorine pesticides, and polychlorinated dibenzo-p-dioxins; and dibenzofurans. The PCB aroclors analyzed included 1016, 1221, 1232, 1242, 1248, 1254, 1260, 1262 and 1268. Analyses of whole sediment also included total metals, simultaneously extracted metals, and acid volatile sulfide. Chemical characterization of samples of pore water isolated from samples of whole sediment at the start of the sediment toxicity exposures or at the start of the sediment bioaccumulation exposures included metals, major cations, major anions, dissolved organic carbon, and additional water-quality characteristics. Concentrations of metals or PCBs in pore water during the sediment toxicity exposures or during sediment bioaccumulation exposures also were determined using peeper samples (for metals) or solid-phase microextraction (SPME) samplers (for PCBs). The bioavailability and bioaccumulation of PCBs in 14 sediment samples were investigated using SPME passive samplers and the 28-d L. variegatus whole-sediment bioaccumulation exposures In general the accumulation of PCBs consistently was predicted through the use of organic carbon normalization and equilibrium partitioning. In these sediments, PCB homologs were accumulated differently based on bioavailability and potential to accumulate in oligochaetes. As part of this assessment homolog specific biota sediment accumulation factor values were developed that could be applied across the larger site to predict tissue levels of PCBs. The whole-sediment toxicity tests done with H. azteca and C. dilutus met the established ASTM and USEPA test acceptability criteria. The most responsive H. azteca endpoints were day 42 survival normalized young per female and day 28 biomass and that the most responsive C. dilutus endpoints were adult biomass and percent adult emergence. Overall, between the two species, the most responsive endpoint assessed for these two species was H. azteca survival-normalized young per female (67 percent of the samples classified as toxic). Concentration-response models (CRMs) and site-specific sediment toxicity thresholds (TTs) were generated with matching sediment chemistry and sediment toxicity data. Sediment chemistry, pore-water chemistry, and sediment toxicity data were evaluated for as many as 26 sediment samples from the Anniston PCB Site. The reference-envelope approach was used to identify the sediment samples that were toxic to benthic invertebrates. This procedure involved identification of reference sediment samples, normalizing the toxicity data to reflect control responses, developing a reference envelope for each toxicity test endpoint, and designating each sediment sample as toxic or not toxic for each toxicity test endpoint, for each species, and for all species combined. These results demonstrated percent emergence of adult C. dilutus, biomass of adult C. dilutus, and reproduction of H. azteca normalized to percent survival were among the most responsive endpoints that were evaluated. Therefore, these endpoints were selected for CRM development. The site-specific TTs for whole sediment provide a reliable basis for identifying toxic and not toxic sediment samples in the Anniston PCB Site (that is, for correctly classifying the sediment samples used to derive the TTs as toxic or not toxic, for the endpoint used to derive the TTs). Among the 69 TTs for sediment, the TTLRs for total PCB homologs [499 to 1,870 micrograms per kilogram dry weight (μg/kg DW)] and for lead [(9.48 to 10.3 milligrams per kilogram (mg/kg) DW] based on reproduction of H. azteca or based on emergence or biomass of adult C. dilutus, were the most reliable. Such TTs had low rates of false negative errors (that is, only 0 to 11 percent of the samples below the TT were toxic to benthic invertebrates), low rates of false positive errors (only 0 to 6 percent of the samples greater than the TT were not toxic to benthic invertebrates), and high rates of correct classification (that is, 92 to 96 percent). The site-specific TTs for PCBs and other COPCs derived in this study also were compared to empirically based sediment quality guidelines (SQGs), to equilibrium-partitioning based SQGs, and to the results of spiked-sediment toxicity tests. The results of this evaluation indicated that the site-specific sediment TTs for PCBs were comparable to the consensus-based SQGs that were derived for PCBs. In addition, the site-specific sediment TTs for PCBs are well within the range of SQGs derived using the equilibrium partitioning approach. The site-specific sediment TTs for PCBs also are consistent with the results of chronic TTs that have been estimated for benthic invertebrates using the results of spiked-sediment toxicity tests. As the site-specific sediment TTs for PCBs are consistent with empirically based SQGs, equilibrium-partitioning based SQGs, and results of sediment-spiking studies, these site- specific sediment TTs likely represent the concentrations of PCBs that are sufficient to cause toxicity to benthic invertebrates (as opposed to simply being correlated with adverse effects on the survival, weight, or reproduction of benthic invertebrates). Importantly, such site-specific sediment TTs have been demonstrated to accurately classify sediment samples as toxic or not toxic to benthic invertebrates at the Anniston PCB Site. In contrast, the TTs for metals, PAHs, and organochlorine pesticides were generally lower than consensus-based SQGs (that is, probable effect concentrations), and LC50s (median lethal effect concentrations) generated in spiked-sediment toxicity tests, indicating that these COPCs are likely not the main contributors to the observed toxicity of the site sediments evaluated in this study. The reproduction endpoint for H. azteca provided lower TTs compared to the day 28 biomass endpoint for H. azteca and the emergence or biomass endpoints for adult C. dilutus provided lower TTs compared to the day 13 biomass endpoint for C. dilutus. Ingersoll, C.G., Steevens, J.A., and MacDonald, D.D., eds., 2014, Evaluation of toxicity to the amphipod, Hyalella azteca, and to the midge, Chironomus dilutus; and bioaccumulation by the oligochaete, Lumbriculus variegatus, with exposure to PCB-contaminated sediments from Anniston, Alabama: U.S. Geological Survey Scientific Investigations Report 2013–5125, 122 p., http://dx.doi.org/10.3133/sir20135125.